C. H. Hanson offers the Toughest Insulated Tools in the industry. Virtually indestructible C. H. Hanson Insulated Hand Tools are the most impact resistant & abrasion resistant tools available. Nylon 11 is the hardest wearing and longest lasting protection of any insulated hand tool on the market and C. H. Hanson is the only manufacturer to use this unique injection molding process to permanently bind Nylon 11 to all our insulated tools. 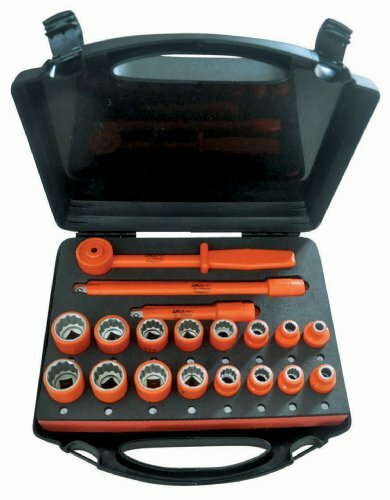 PVC dipped insulated tool will never reach maximum protection for the user as they are not abrasion resistant and PVC can easily be removed from the tool handles over time. All C. H. Hanson Insulated Tools carry a lifetime warranty on the tool & insulation and exceeds the International Standard: IEC 60900:2004 and ASTM F1505. C. H. Hanson performs a 100% production test by submerging the insulated tools in water with 10, 000V of electricity to insure the safety of the user and maximizing personal protection. All C. H. Hanson Insulated tools are rated for 1, 000V, Flame Retardant and Category "C" rated for extreme cold climate use. C. H. Hanson manufacturers the widest range of 1, 000V rated tools for electrical and live line working. If you have any questions about this product by Palmgren, contact us by completing and submitting the form below. If you are looking for a specif part number, please include it with your message.